In June 2014, I curated and co-hosted a small film festival at Birkbeck Cinema, in collaboration with the Birkbeck Institute of the Moving Image and the Derek Jarman Lab. The festival, ‘East London on Film’, arose from a number of conversations and my own research into the filmic history of East London, and the representation of particularly Stratford, in light of the recent Olympic Games and the rapid subsequent redevelopments around Hackney Wick. Many of the films we were able to show came from independent filmmakers, using film as a documentary tool, but also as a political and personal response to the sweeping changes with the Olympic park brought. We screened Hilary Powell’s important film ‘The Games’, parodying past Olympic films such as Leni Riefenstahl’s ‘Olympia’. But also Saint Etienne and Paul Kelly’s ‘What Have You Done Today, Mervyn Day?’, part of their London Trilogy; alongside a short film by Birkbeck student and filmmaker Sally Mumby-Croft, featuring Iain Sinclair. We were able also, to compare these recent films with older representations of the East London landscape in flux, including Barney Platts-Mills’ fantastic ‘Bronco Bullfrog’ (1969), and Lorenza Mazzetti’s post-war ‘Together’ (1955), which was part of the Free Cinema collective set up by Lindsey Anderson. For the second day of the festival, we were able to look closely at an important pair of documentaries. The first, ‘Vince, Paul, Lawrence and Richard’, broadcast by the BBC, considered the lives of four young children in Stepney in 1971, and the impact of the area on their futures. While the second, a filmic response to this initial documentary by artists Chris Dorley-Brown, revisited the boys featured in the BBC Documentary and critiqued the ethics and role of documentary, not only in these children’s lives, but also in the wider historical representation of East London. It was fantastic to have Chris Dorley-Brown at the festival to discuss his film, and his wider photographic ‘Re-Shoots’ series, considering the elements of time-travel and the photographic moment. The short film above, was filmed and edited by Jeongmin Kang and Fiona Baihui at the Derek Jarman Lab, featuring Chris in discussion with Bruce Eadie, who co-organised the festival. I have lots of people to thank for helping me curate and put on this festival, firstly the Derek Jarman Lab and key people like Bartek Dziadosz, Jeongmin Kang, Fiona Baihui, Alistair Dunlop, and of course Bruce Eadie. I have to thank all the filmmakers who were involved, Hilary Powell, Sally Mumby-Croft and of course Chris Dorley-Brown. Also, everyone at Birkbeck, particularly Sarah Joshi, for all her help. 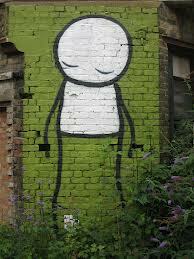 A small collection of photographs, exploring East London in 2013. Reflections through photography of current research. A small selection of images from a walk up the Suffolk coast, in the footsteps of W.G.Sebald’s ‘Rings of Saturn’ in 2013. This short film piece, was conceived as part of a visual exploration and documentation of unknown places in East London. It was my attempt to discover unknown spaces and really look at them. 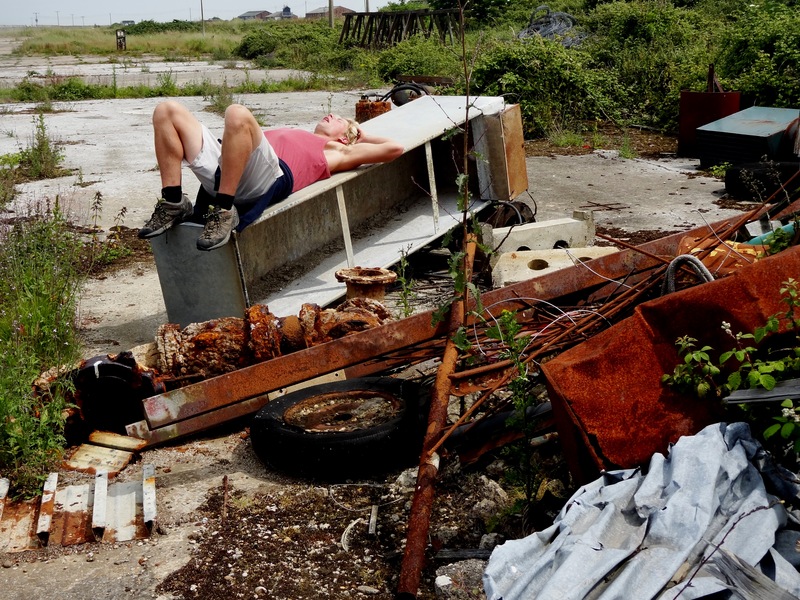 This abandoned warehouse on edge of the Regents canal is no longer being used, and involved a kind boatman to reach, but had this extraordinary atmosphere about it, which was both decaying and also teeming with life. A tiny idyll in the middle of the city, which was being slowly returned to the wild. This piece is an extract from a longer piece about my walk up the Suffolk coastline, following the footsteps of W.G.Sebald’s work The Rings of Saturn. By walking this landscape, which I had mentally drawing and redrawn in my head many times whilst reading the book, I endeavored to explore the inner recesses of Sebalds motivations and methodology in writing this book. Using walking as a critical practice, and as an archaeological tool which would alter both my experience of the landscape I encountered, and of the book itself. In some ways this was a successful endeavour, and certainly an interesting one. But, I also found it sycophantic and ultimately concluded that Sebald himself would have been strongly against people following him like tourists, or lemmings. While he became the shepherd, crook in hand, which led the way; this became about my own experience and memories. My own observations and imaginations. And so I find myself, one foot in front of the other, toes pressing into my insoles, into the tarmac and the earth below holding me up as I march towards the sea. The salt drifting in the air in front of me..
It’s a modest start, but the work which it opens into is a piece which completely altered my core. A body of writing which cannot be rounded down to the simple perambulations of travel writing, nor the excavating regurgitations of history. In that ambling prose for which Sebald was so renowned, The Rings of Saturn is the epitome of that oft evoked portmanteau, psychogeography. A melancholy wander across the coast of East Anglia, which re-sees, recalibrates the landscape drawing us into Sebald’s thoughts and the intractable webs of his memories. Travelling from Norwich down to Orford, through Southwold, Dunwich and Sizewell, Sebald explores these places sitting on the soft membrance between the past and the present. Drawing on the anatomical history of Sir Thomas Browne, to the Dowager Empress Tz’u-hsi with her silkworms and the overwrought Victorian poet Algernon Swinburne; he draws together these threads with a seamless fluidity, showing the past as continuously present, and the act of walking as a part of what Eric Hobsbawn called a ‘protest against forgetting’. I have loved this book since the moment I smoothed its cover back and laid my eyes on these opening words. So, it seemed natural that in the summer of 2013, I would take Sebald’s words and trace them with my feet. On my own ‘English Pilgrimage’, as the original German title of the book most evocatively suggests. Almost incongruous to the book itself, with its melancholic and often morbid tone, my partner Tim and I set out on a day of violent sunshine. Starting from Ipswich, walking in the opposite direction to Sebald, we marched on the road to Orford, following the curls of the tarmac and learning to ignore road signs which seemed to double back on themselves in some unique dimensional configuration. Endless and timeless in their unfixed wander. Along the coast these roads melts into the lagoon of waters which is the River Ore. A river of black gold, which runs parallel to the North Sea; the two bodies rippling southwards in undulating corrugation. Long marshlands sink into gentle shores, and little islands rise up across the tributaries with stately houses nestled in well placed fir trees soaking-up the rising tides. As the sun began to set on that first day, we spied the stout battlements of Orford’s castle as it mounts the town’s small hillock, and made my way down to the wetland meadows behind the town’s famed pub to set up camp. We had intended to stay at the back of the pub in the listed ‘campsite’, but soon found that local opinion had since driven casual campers to less idyllic spots out of the town. The wetland meadows therefore became our illegal occupation, nestling our little black tent behind the lip of the bank and beyond the bend of the wetland path. In a medieval configuration, these fields still sweep up to the very lip of the habitations, affording a panorama of the town with its little marina on the river. In the morning, the sunshine pierced through the gaps in the zip, waking us early as it climbed over the horizon and flooded the fields with gliding gold light. Peering beyond the rays I looked out across the river. 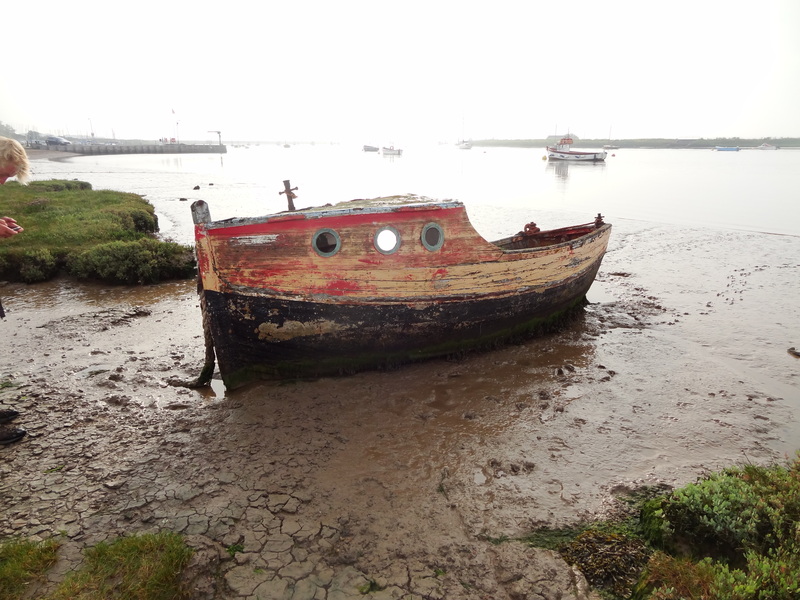 Past the mud flats and the little boats bobbing, to the spit of Orfordness in the distance. This is where I had been longing to go. Orfordness. This sandy peninsula of shale beyond the mainland, sounding more like ‘awfulness’ than anything else. A spit which the locals, in that very familiar shorthand, called simply ‘the island’. To get there, the National Trust run a small boat which takes you across the small width of the Ore, with a short portly man volunteering his own boat for the purpose. After hours of waiting for this small vessel to cross the 20 metres of water, we boarded the boat and I felt not only of crossing the Styx but of transcending into some Elysium, into another world. Sebald describes this landscape desolately. He recalls the emptiness of this desolate landscape, the legends of seamen eager to avoid its lonely shores for fear of madness. Walking across the dry flatness you could feel the land pulsating under the sun. The small sand pebbles rustling beneath foot, the nesting wild birds squawking from the rushes and reeds. But, despite this, there is a strange silence which echoes across the spit. As if time has rolled to a gentle stop. 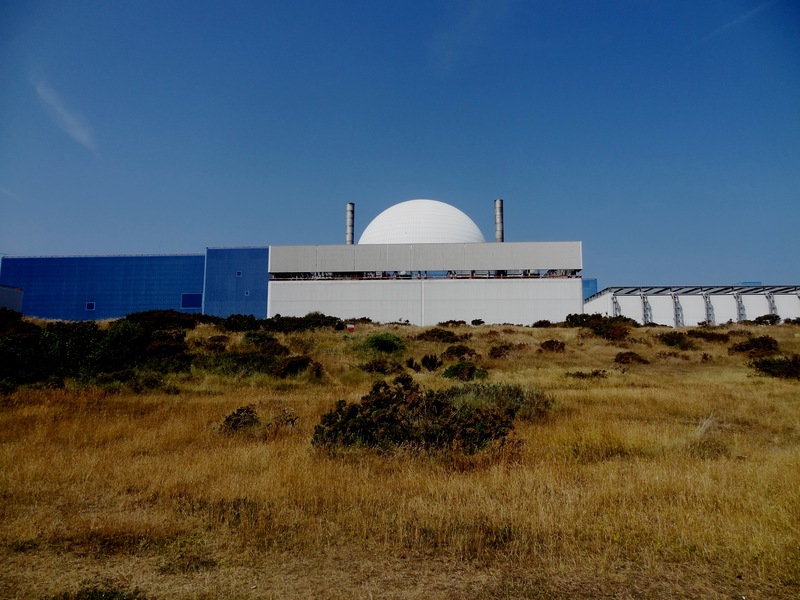 Up until the 1980s, Orfordness had been a secret military testing site, the home of hundreds of military engineers and inventors during the Second World War when a large scale radar had been developed in the middle of the little island, leaving today the imprint of its ribbed crater at its heart. Outhouses, now worn down and moss clothed, punctuate the level land; and strange concrete pagodas sit in the distance, still cut off in the ‘forbidden-zone’ of the island. 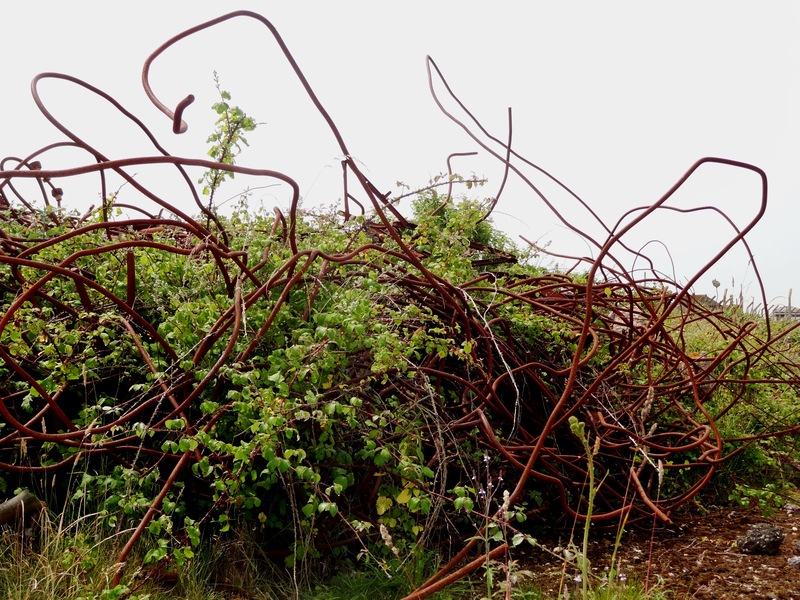 Along the shingle, rusted iron structures, wires, coils and bolts litter the ground. Mechanical ruins sitting orange against the warm white stones. It is a place, which like many other military spaces has not been dismantled, but abandoned to time. That very passive action which seeks both to placate history and slowly erase it. Like the Nuremberg stadium in Germany, for which destruction would be too pointed a statement. 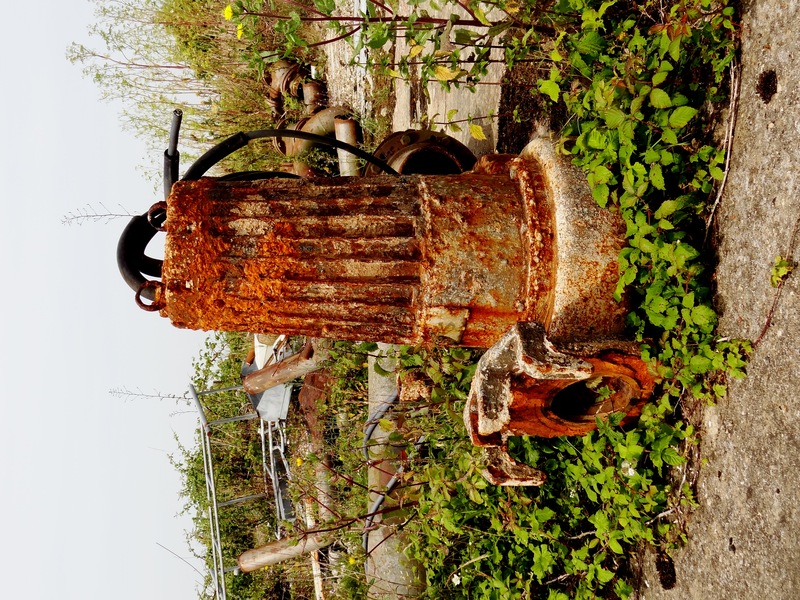 The ruins of post-industrial Europe and North-America, laid waste by change. And, of course, the Auschwitz internment camp which still stands in its own putrid history. Ruined monuments for which decay is the emblem of the undigested past; a sign of disillusionment, difficulty and the desire to forget. In one of the little outhouses, drawings and photographs have been blu-tac’d in an ad-hoc display, showing the vestiges of the great inventions and military projects run at Orfordness. The towers, guns and, most impressive of all, a huge transmitter photographed in black and white made from a long pine trunk, on which wire had been coiled in screw-like concentric swirls, held down by yachting rope. Here, the apex of Suffolk’s engineering talents, shows the self-made beacon, beautiful in its simplicity. The product of military minds brought up by the sea, looking out onto the horizon at what could be beyond. These homemade devices were followed by more destructive weaponry of war. Earthquake bombs, aerodynamic machines, gas turbine engines, and, in the 1960s, post-Manhattan project ballistics tests on early nuclear weapons. Many of these projects seem an anathema to the benign landscape as it now sits. And yet, that whiff of anticipation, of secrecy and military efficiency still lingers. 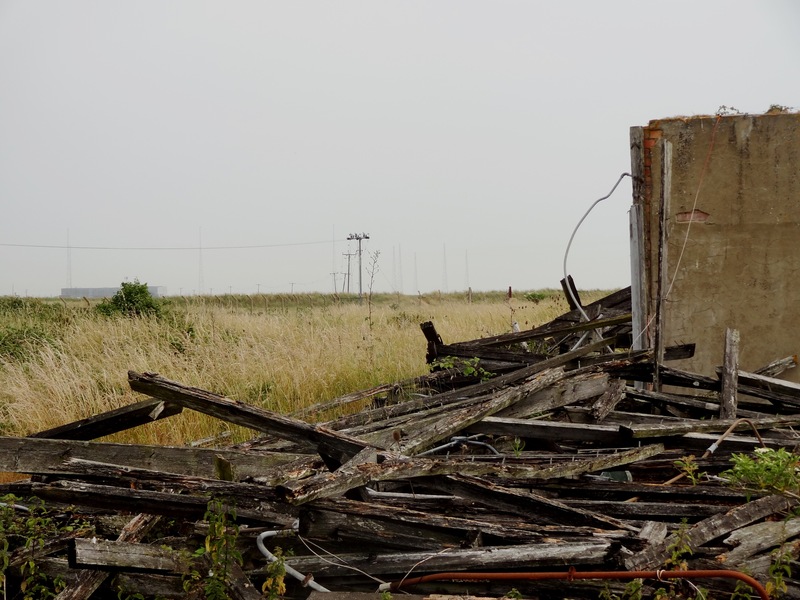 When Sebald visited Orfordness, soon after the National Trust had opened it up to visitors for the first time, many of the projects which had been carried out here would have still be secret. And yet, while concentrating on his own psychological reaction, we see how ruins of a place so geographically separate, so intentionally isolate, brought with it the decaying isotopes of this history. The dynamics of military power, of warfare and mechanical invention; reduced to rusting rubble scattered on a lonely spit. It is here on our walk that the limits of literature became clear to us. While Sebald discusses many parts of his walk, and the physical exertions of the act of walking, he discusses little which is geographically useful to the traveller. His own attempt to shadow the walk in its own veil of mystery no-doubt. From the hand-drawn maps, bought along with our bread from the gentrified village shop in Orford, we had assumed the right to walk across the spit of Orfordness and up to Aldeborough. And yet, reality is never the same to the maps simple cartographic lines, and so we found ourselves almost stranded back in Orford, and without a little hitching around the Snape of the river, would have been forced to another night on the marshes. At Aldeborough, the rural idyll suddenly becomes a burgeoning seaside town with long boulevards, painted railings, beach huts and white gabled housing. It is the place of 99p flakes, scampi, chips, malt vinegar and deck chairs. Elderly ladies gingerly dipping their toes into the sea up to their swollen ankles while older men flop their canvas hats over their eyes and slumber. As a determined wild-swimmer, Tim dived in, creating much entertainment to the locals on the beach. Pounding up and down, his arms appearing out of the water as little blobs on the distant waves. The sea twinkled, and the town behind it stood cheery in its decaying whitewash. It is incredible how quickly a new landscape can change you. 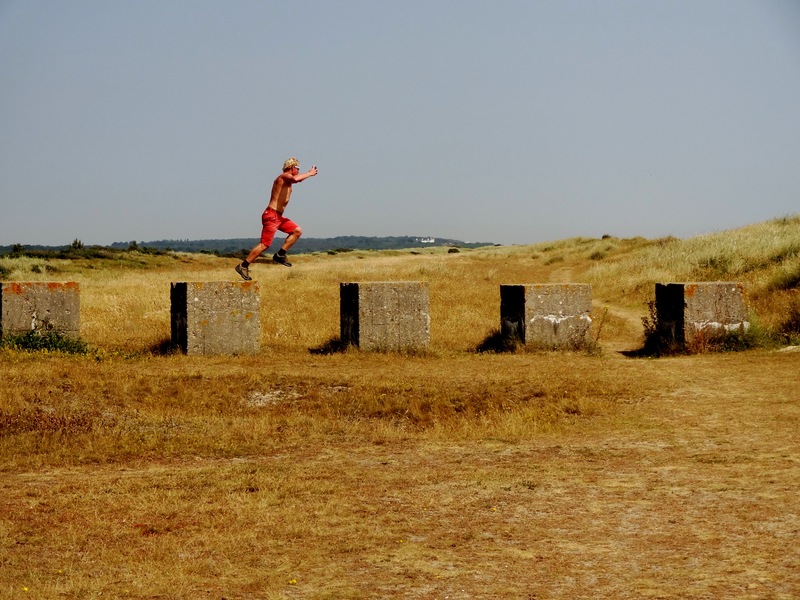 The melancholy musing of Orfordness was replaced here by a playfulness, a sense of abandon on the beach. Later that day, we marched up the sandy shores, reaching another town, Thorpeness, up the coast. We were now rapidly diverging from Sebald’s original path, but the warm sands glowed ahead, guiding us up them like a yellow-brick road, and we soon forgot the origins of the journey and let the landscape guide us. Unlike Orford, with its sense of authenticity in the age of its rambling medieval roots, Thorpeness is a strange parody of a medieval town. Built almost entirely in the nineteenth century by the Ogilvy Family, the town is contrived with mock-tudor fronts, with a large watertower elaborately decorated as a wooden clapboard house. Like a house which has suddenly, like Alice in Wonderland, eaten a mushroom and grown upwards into the sky, the watertower sticks up from behind the pine trees that line the coast, punctuating line of the soft dunes and leading you into a completely different landscape. In the middle of the town, we passed the central lake, entirely man-made and edged by perfectly maintained chain-fences and just the right amount of reed and water planting. It is the lake which apparently inspired J.M.Barrie’s Peter Pan. Barrie, who was a friend and sometime guest of the Ogilvy’s in Thorpeness, was apparently inspired to write the section where Peter almost drowns with Wendy, allowing her to escape on a ballon while he waits for death uttering that unforgettable line, ‘to die would be an awfully big adventure’. But looking out on the lake I can’t see it and I am disappointed.Though Barrie certainly did stay here while he was writing Peter Pan, I can’t imagine how this lake, with its contained and measured expanse, could inspire such a dark and potent image. One which struck me as a child and has stayed with me since. How could one of the great moments of literature, have been inspired by the most benign and controlled replications of nature. This Victorian vision of a wild medieval past, made palatable and suburban. Seemingly miles away from the wild edges of the coast, being ravaged and endlessly corroded by the sea only minutes away. The banks of Orford, on the suffolk coast. 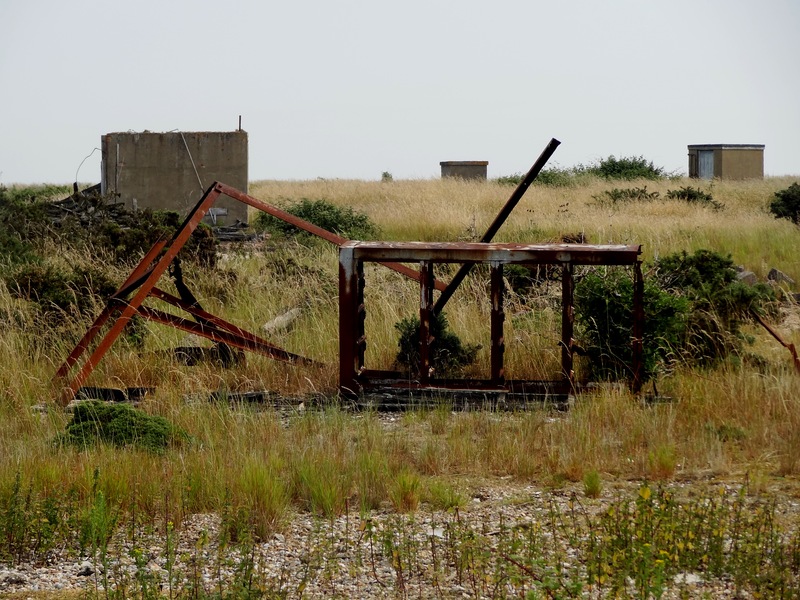 The derelict remains of the military base on Orfordness. 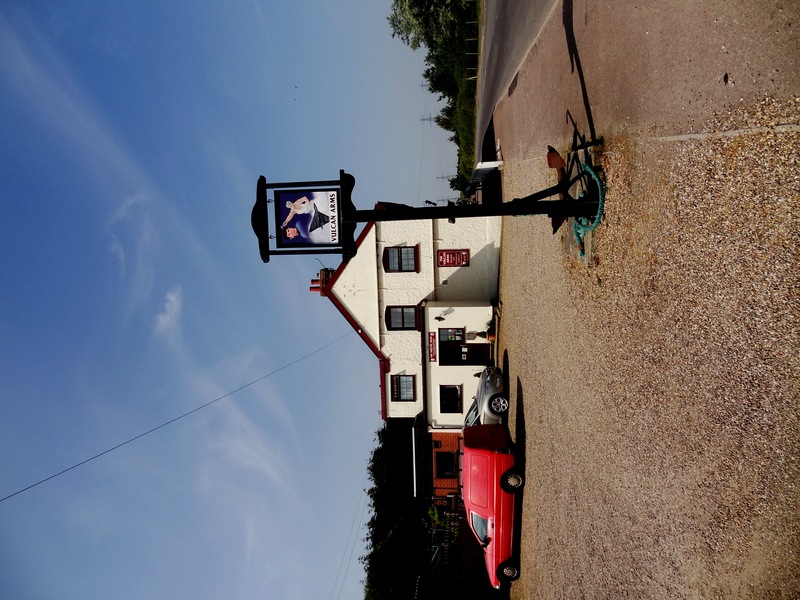 The Vulvan Arms at Sizewell. 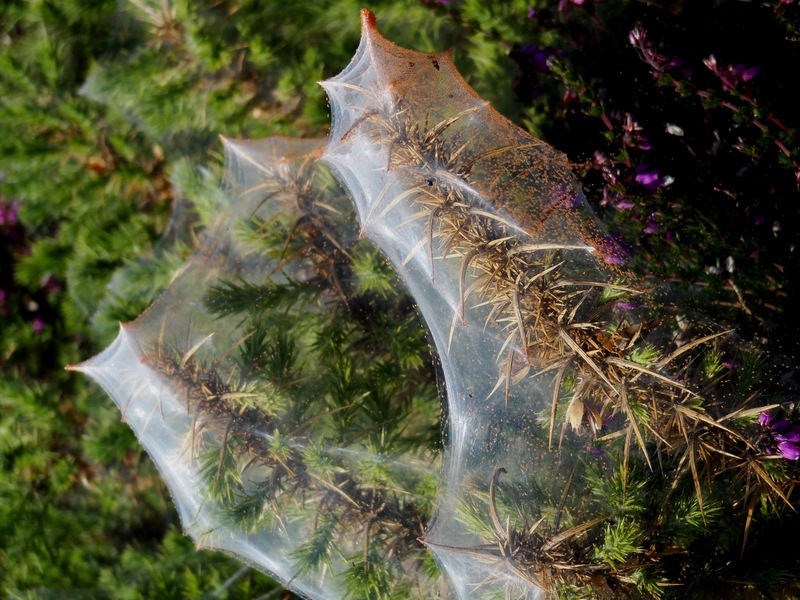 The Nature Reserve around Dunwich. 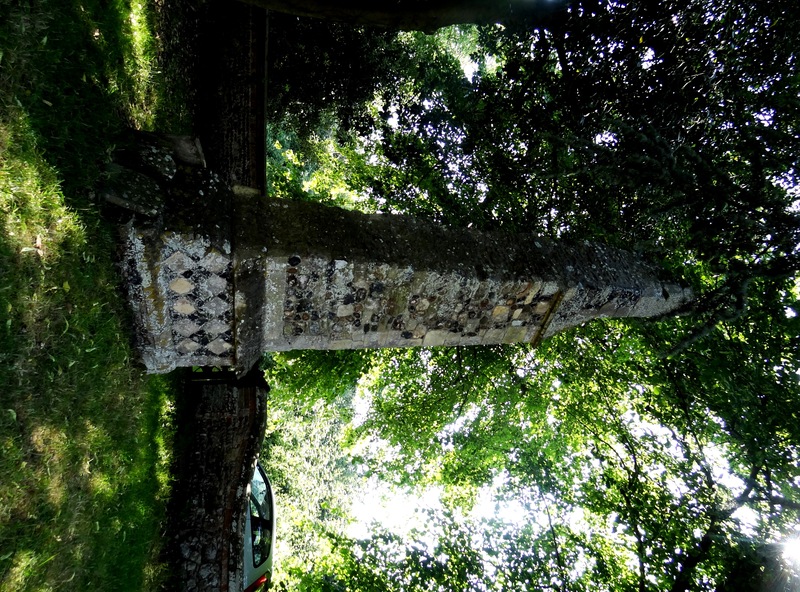 The remains of the original church at Dunwich, preserved in the church yard of another church. 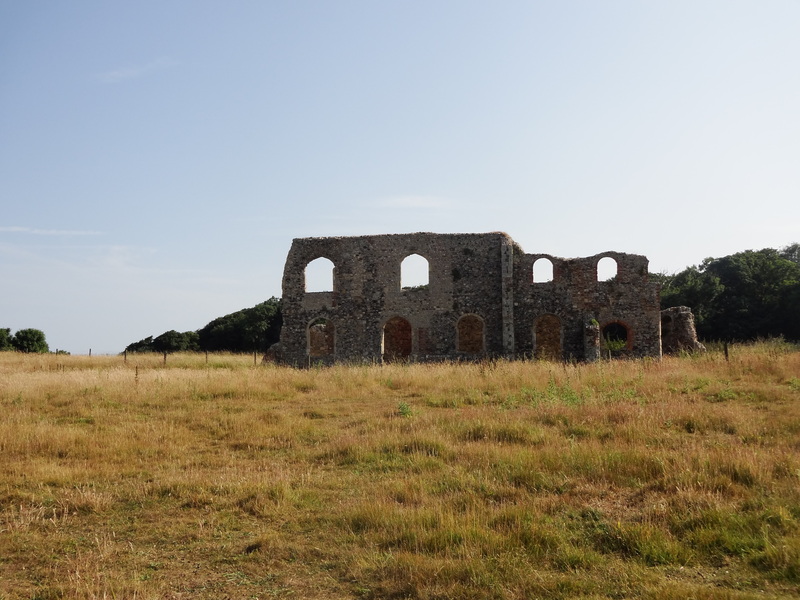 The ruins of the old Monastery at Dunwich. In June 2013, I was involved in the Thread Radio project as part of a series on the theme of ‘Sin’. The Thread is a free conversational space that goes beyond the university, a place where complex ideas can flourish in public dialogue. Created and produced by PhD students from the London Consortium, it brings artists, academics, amateurs and professionals together in wild and wide-ranging discussion. The Thread uses speech as a tool for research to open up new and unexpected angles. This is live radio thinking. Tacita Vero and I co-produced a show around the notion of ‘pride’, discussing the relative changes in the morality of pride as a sin and its current usage in relation to particularly urban cultures suggested community projects and projections of pride in minority groups such as racial pride, pride in sexual orientation or in gender. In part one I interviewed Marie Murray from the Dalston Easter Curve Garden to discuss the pride of these remarkable community project in the East End, which is now under thread from redevelopment. In the second part Tacita discussed the notion of pride in one’s work with three well known graffiti artists and commentators, STIK, RYCA and Richard from Scrawl Collective. To round off we played the national Anthem of Sealand, a disputed micro-territory off the coast of Suffolk which Tacita has been involved in researching in relation to concepts of nationhood and piracy. Listen to the programme here or by going to the Thread Radio website or the Resonance FM website (104.4fm). Tacita and I will be working on a Thread Radio Project for Summer 2014 so listen out!